just read it... now, about those monthly undine (which, by the way, i totally support it if u wanna scanlate it) are you gonna do all of the mag or just the manga part?? > She's barely recognizable with that baseball hat and her pigtails untied. Akari's got no pigtails, as she has told Akatsukin countless many times! It's strange to note how Usagi Tsukino's hairstyle also got insulted by her boyfriend, maybe it's a common Yunichi Sato influence? But if someone can hook me up with a copy of volume 4, it will be much appreciated. Got the rest in Taiwan. I saw this online folder full of ARIA stuffs.. Think there's some Monthly Undine in there..
You should have asked me last month. Nav 55 actually got TL'ed on...24th March 2009! Needs to be put into a proper format for the QC'ers and TS'ers. Stay Tuned. The blandest chapter on vol. 11. I think it's the one chapter you should bring up on a discussion if you want to prove that nothing happens in slice-of-life works. BECAUSE NOTHING HAPPENS IN THIS CHAPTER. - Don't write this chapter at all. Judging from the 'ridiculous outfit' part, I'm guessing it's President Aria. I think Aria's outfits come from a mix between Akari's and Alicia's fashion sense with a lot of input from Aria himself. Of course we know Aria is an avatar of one of Amano's cats and, in my opinion, might be a case of self-insertion. However my main disappointment with this chapter is that Amano has ideas for stories many levels better than what she used for this chapter, and it is definitely a chapter she should've avoided releasing on the endgame. We're almost on the last volume, and there's still some interesting stuff that didn't get animated, hopefully we'll be getting there soon. I 've followed this seies since I found out how to read manga on the internet. It's been a long time. There was also a time when I thought the series would be dropped. Then you guys started to work on it... and until now, I have been waiting for evey chapters. Thank guys, not only for this chapter, but also for your diligence through out the whole series. Hehe... I guess I am not the only one who is not so fond of that freaky kitty. It's nice to have an animal sidekick, but it's a bit silly to have it chew up so much scenery without even being remotely funny or relevant. I think the series would have been an unchallenged slice-of-live masterpiece if that cat wouldn't have been around. Luckily the cat in Amanchu! stays way more in the bacground. Oh come on...Aria-shachou is a toy for us to laugh about whenever Maa-chan shows her unrequieted love. Seriously, I thought DA CAT was ok and funny when he tried to court Hime. i believe you guys forgetting something here. 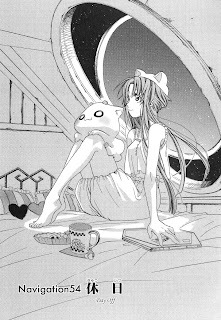 Just downloaded the booklet scans for Aria the Natural DVD, volume 1 to 9, some 250MB. There is a rather controversial find in it. Look at the picture "Aria nn3 (3).jpg". Look at the lower right corner. There is a sketch for the anime episode 7, the cat kingdom maze story. Look at the underside of the gondola and there is a big shipscrew attached to it... Now I wonder whose gondola is that? Maybe it's Pokoteng's small electric launch, so it's OK, but if it's Akari's boat, that would be massive cheating! Second page on the Aria the Natural Navigation 3 DVD booklet, this part? That bit circled in red says "Aria Shachou's Gondola"
On the other hand, prima's white gondolas have some weird script written all around the hull, under the edge of the deck. I don't think any of that is legible, even at 1280HD resolution, but that may be some kind of propulsion charm, which is required to activate the alchemical properties of the gravity crystals hidden inside. Trainees don't enjoy that benefit, they are expected to work hard after all.